First published in 1933. The purpose of this work was to bridge a gap in English philosophical literature by completing the elaborate history of Bosanquet and to stimulate and enrich the whole study of aesthetics by means of his personal destructive and constructive criticism. This title will be of interest to students of philosophy. 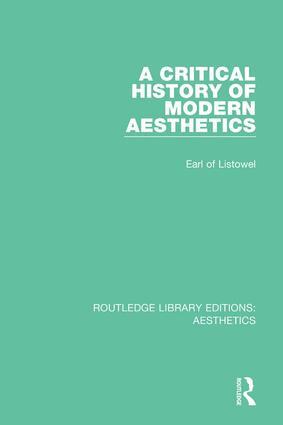 This set reissues 6 books on aesthetics originally published between 1933 and 1991. The volumes provide a clear introduction to classic philosophical accounts of art and beauty, as well as exploring the significance of aesthetics in more recent developments in philosophy.